I really did not taper for this race, with my eyes on Umstead and my first 100 miler this was going to be a long training run. Saying that way down deep inside, I wanted to set a new PB. Monday I ran 10, Tuesday 7 and 9 on Wednesday for 26 miles. Saturday morning I woke up at 0430, had a nice breakfast of 2 waffles, 2 breakfast drinks and a pop tart. Total carb intake was about 130 grams, finished around 0530. And even thou I’m trying to break my soda habit, I still had my traditional Diet Dew on the ride out to the park. It is a 45 minute drive to the race location. Arrived just after 0700 and met up with a few of my training buddies. 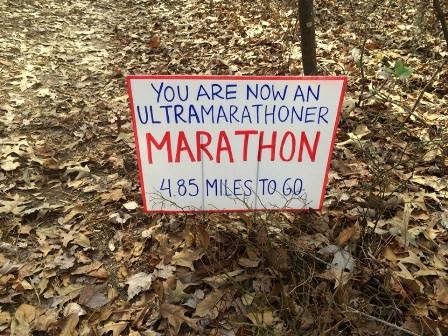 For some this would be their first ultra distance (>26.2 miles) and for others their 75th (George). This was my 21st race at an ultra distance. A bunch of other good friends ran this race as well, Steve (2nd overall), his wife Ally (1st 50k), Mike K and Michele H.
The weeks prior we had all been hoping and praying for good conditions, none of us minded some cool temps, but no one wanted rain. Thursday night a high pressure system rolled into town and the forecast looked like an early summer forecast not the conditions for the first day of winter. A high of 72 was predicted with cloudy skies and no rain. Temps at race start were in the mid 50s and the conditions improved from there. Truth be know the heat did not give me any real issues, but I did hear a few folks commenting on slowing down because of the heat. Mile 1 10:17 Ran the opening mile or so on the entrance road of First Landing State Park, to a 180 degree turn around. This took us to the Cape Henry trail head just shy of the start/finish line. From here on out all miles were on trails until the finishing .2 miles. Mile 2 10:08 My wife worked the 64th Street Aid Station, and I could not resist getting a quick kiss on my way through the stop at 2.9 miles. Ran all of these front half miles with Andrea, it was fun to pass the time talking about family, goals and previous races. Approaching mile 13, I needed to open up my legs some. Mile 17 9:21 Back at the 64th Street Aide Station at mile 17.7, but no kiss this time around. I was in and out so fast my wife barely caught a glimpse of me. I was feeling pretty strong and making good time. Mile 18 8:56 Throughout the day my GPS was spotty at best. At times I was not real sure of how fast or slow I was running. I had no reason to be pushing out sub 9 minute miles, but everything was working. I looked at my watch a few times, and remember seeing times much slower then I knew I was running. I kicked it up a notch hoping to be running near 10:00 pace but looking back I was running a touch to fast here. My vigor got the best of me. Mile 23 11:35 Came into the second to last aide station feeling pretty good, grabbed two cookies and a cup of Gatorade. Fast walked back onto the trail and up a little incline, finished off the cookies and Gatorade. Learned an important lesson here, with a dry mouth don’t stick a whole cookie in your mouth….cotton/cookie mouth almost took me out. After recovering from my cookies I felt the need to find a tree. After getting back on the trails I was having a hard time running the up hills…the inclines taxed my lungs and heart rate more then prior to my little “relief” break. I think after my pit stop my running rhythm got off tune. Mile 27 12:42 (Doggie stop) During yesterdays 50k, at mile 27 I ran up on a young couple walking their dog, a miniature schnauzer. I had to stop and say hi… I told them about our Hanna…it felt good but I had to say a quick goodbye, and ran the next half mile with tears in my eyes. Hanna is always with me. Mile 30 12:21 Last aide stop, and the turn for home. I got a bit lost on this section, not off course lost, but lost with how much further I had to go and how hard I could push it. I was struggling a bit, could have used a another GU prior to this and was feeling low on energy. Mile 31 11:06 When I finally was able to get a bearing on where I was distance wise, my legs were pretty much zapped. 5th PB in my last 5 races, and 31 minutes faster. FINISHED: 5h 23m 00s, burned over 4000 calories and placed 16/51 in my age group. This was the second race where I used the Endurolytes tablets. I took 3 tablets (and 1 GU Gel) every 6 miles and I do feel they help keep my legs alive during the final stages of a race. Another excellent event put on by the Tidewaters Striders. 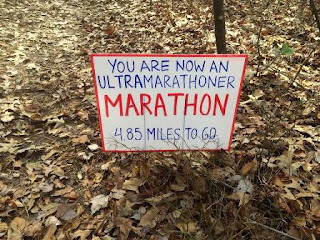 I highly recommend this 50k to anyone wanting to run their first Ultra, it’s not easy…but it doable. FINAL THOUGHTS: Hats off to everyone who ran this event, for some it was a real battle out there. But no one gave up and I believe everyone walked away with memories of a great day on the trails. I hung around at the finish and was able to see Andrea and George finish about a minute of each other. Jeffery finish first out of our bunch. Unfortunately I had to leave to make a prior appointment before seeing Danny and Steven finish. This entry was posted in Uncategorized on December 24, 2013 by burk.brian@yahoo.com. Great recap, Brian. Congrats on the PR. Love the doggie stop! Thanks, Steve you sure rocked it….as well 2nd overall! Way to go! Great recap- sounds like it was a great run! Thank you, yes it is a nice event, local club does a great job hosting it. 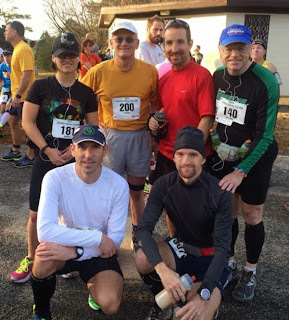 This was my first 50K and as you said… It’s doable …. I finished! I’d certainly do this one again. Thanks for sharing your experience. 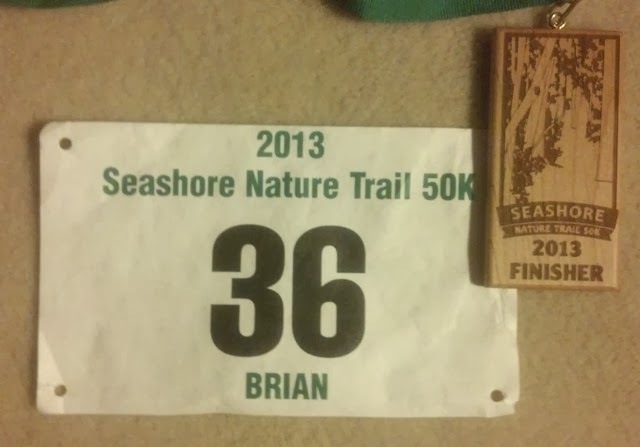 Great report Brian and great job on the 50K! Now that I have my first one under my belt, I can work on improving my time next year. Yes, ultra are a different breed. Enjoyed your race report. It was my first 50k and I thought it was a great experience. I see you have done the 24 hour race at Sandy Bottom every year. A group of us from OBX (most of them at Seashore) are running it for the first time….very excited. Would love some pointers and tips. Great recap Brian, Thanks for sharing. I’m thinking on running it this year. How hilly and technical is it? You don’t happen to have the elevation profile by any chance? Not technical at all, rolling hills….it is run in first landing state park…more like walking trails. Great first 50k! p.s. I’ll be there…say Hi!